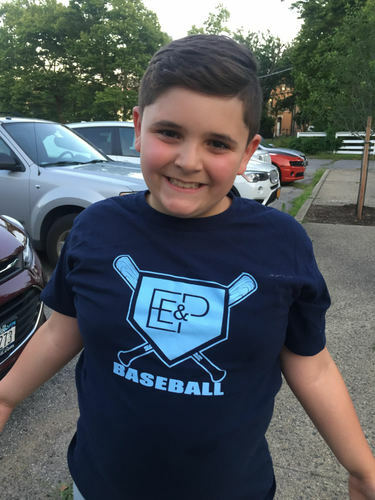 No matter how far the EE&P team advances in this year’s Borough Cup, they’ve already proven to be winners -- especially, one particular outfielder. J.J. Yannantuono has been playing for the Staten Island under-8 division club despite the passing of his father, Joe, on June 19 of this year. It’s something his dad, who doubled as his coach and biggest supporter, would have wanted. “The biggest thing Joe wanted in his life was for J.J. to be happy, and playing baseball makes J.J. happy,” said Christine Buono-Yannantuono, J.J.’s mother and the wife of Joe, who succumbed to a long battle with cancer at the age of 38. While the EE&P squad (named for the law firm of Elefterakis, Elefterakis and Panek that sponsors the team) is technically in its first season, it’s comprised of many players who have competed together in different youth leagues over the years with Joe Yannantuono as coach. A math teacher by trade, Joe’s real passions were for his family and for sports -- especially the New York Mets and pro wrestling. Joe’s influence extended beyond the Yannantuono house. “There were so many of his former students who showed up at the wake,” said Christine of the 400-plus mourners, which included graduates of Moore Catholic and St. Peter’s Girls high schools -- the latter of which he also coached softball at, guiding the Eagles to their first win in team history. “I knew Staten Island was small, but every time I go somewhere, I meet someone who knew Joe,” added Christine, who was amazed at the outpouring of beautiful stories people had about her husband, whether telling her in person or posting them on social media. It’s clearly evident his love of sports was passed down to his son. Joe and J.J. often waited in the Citi Field parking lot after Mets games, hoping for autographs. Once, David Wright stopped his car, got out and signed a ball for them. They watched wrestling shows together, and Joe coached J.J. in basketball. After dealing with cancer a first time, Joe had received a bone marrow transplant about six years ago “and it really gave him a new life,” John said. “He had a good four or five years before it came back, and he made the most of it. The baseball lessons taught by Joe to J.J. have been put to good use in the Borough Cup. The outfielder was selected team MVP for their first tourney win on July 18, and there’s a chance he could also see time on the mound in one of the two remaining pool-play games. “It’s been great, watching him grow,” Christine said of her son, who lists Aaron Judge and Jacob deGrom as his two favorite players. “I know his father is so proud of him.